There are some new baby products hitting the market soon and we’re excited about them. When we saw this infant carrier our jaws dropped as it brings together the best of the Baby Bjorn and the very popular Ergo Carrier. Brought to us by the leading European designer of booster carseats (coming to the US in early 2010), Cybex, we predict that the Cybex 2.GO Infant Carrier will soon be ubiquitous upon launch in US stores soon. The seat can be individually adjusted allowing baby to sit in a spread-squat position. Additionally, the head is given the support it needs thanks to the adjustable design. We always wished the Baby Bjorn had these two adjustability features. The shoulder and lower-back support strap bring the most beloved features of the Ergo to this innovative new infant carrier, and makes it usable until your child reaches 40 lbs. Checkout the mamaRoo. Like the hybrid Cybex 2.GO carrier, the mamaRoo is best explained as a combination of the soothing properties of a bouncy seat and an infant swing rolled into in one. The mamaRoo was created by 4Moms which also invented the much-beloved Cleanwater Infant Tub. The creators studied how parents move to soothe their babies and created the ultimate infant seat that not only bounces up and down, but also sways back and forth, mimicking the natural comforting motions of millions of parents. 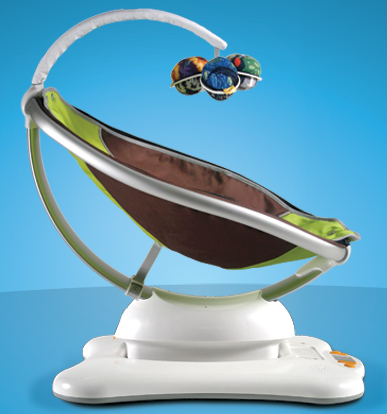 The mamaRoo comes with 5 different pre-set motions and provides a variety of soothing nature sounds. Or, you can plug-in your iPod if your child is comforted by the dulcet tones of Frank Sinatra for example. The mamaRoo will be available nationwide in stores starting late September of this year. The only thing that struck us is that is quite large, but again, that’s coming from someone who forgoed an infant swing because it was “too large” for her NYC apartment and then regretted that choice, only to buy an a much larger exersaucer. We suggest you see the size for yourself and then make a decision. But, there’s a reason the mamaRoo won the industry’s Innovation Award with a perfect score of 10 from every judge. Want to see for yourself how it works? 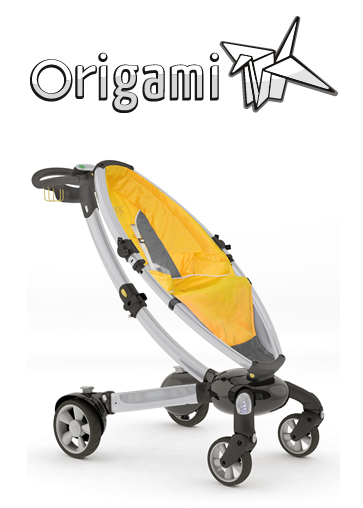 We’re also excited about another 4Moms invention, the Origami stroller. At first blush it looks like a souped-up Quinny stroller. But, oh, it’s so much more. It’s a power-folding stroller. Yep, the first of its kind. No more wishing you had an extra hand to fold your stroller while balancing the baby on your hip. Folding and opening are as simple as pushing a button. Don’t be concerned though, sensors can tell when a child is in the seat, which disables the folding mechanism. The Origami has a built-in generator so the system recharges itself while you walk, or just plug it in. Just 300 feet is all it takes to replace the energy used for one open and close cycle. And, it only weighs 22lbs. Also, the built-in generator means there’s a cellphone charger, an LCD display with a built-in pedometer, speedometer, temperature gauge, and daytime running lights. Huzzah! Only issue. You’ll have to wait until the fourth quarter of this year for The Origami to be available in stores. Is it alright to want a baby so I can get this stuff? I’ve spent a good bit of time over the past few weeks checking out all my friend’s baby swings only to find I don’t really like any of them. I’m loving the idea behind the mamaRoo, and I may just see it as an addition to my wishlist when it releases. It’d definitely save space having ONE item that will replace the swing and bouncy seats! Great review! I am really excited for these products to come out in August!! !